Cymbopogon citratus is perennial and is an aromatic, flavorful grass that grows in southern India and Sri Lanka. It is a common ingredient in the cuisines of Africa, the Middle East, and throughout Southeast Asia. As Thai cooking has become popular, so has the familiarity of ingredients such as Thai basil and lemongrass. 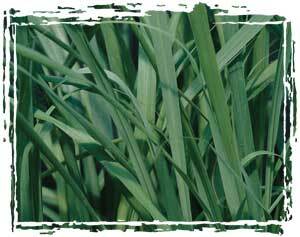 Harvest and Use: Lemongrass leaves are strongly lemon scented and flavored. To use, cut off the root tip, peel the tough outer leaves, and cut away the top part of the stalk. It is the bulb section that is used, but don't throw away the leaves as they make a wonderful tea or flavor in soups, stews, and curries. The stalk will last for several days in the fridge or can be chopped and frozen for later use. In aromatherapy, lemongrass essential oil is a toning, revitalizing, and antiseptic herb. It is used to treat circulation, digestion, as a muscle toner, and for acne and oily skin. It blends well with basil, geranium, jasmine, and lavender. It is excellent for post-diet saggy skin. As a medicinal, an infusion is good for digestive problems in children and minor feverish illnesses. It increases perspiration and relieves spasms. It is also effective against fungal and bacterial infections and is, as such, used for ringworm, lice, athlete's foot, and scabies. 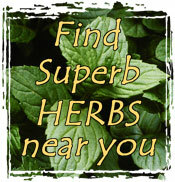 The leaves can be dried and blended with other herbs in insect repelling concoctions. To harvest, cut stems at ground level and use fresh. It can also be dried and powdered or frozen. Cultivation and Propagation: It grows in dense clumps forming a bulb at the base and hollow, canelike stems. The bladed leaves are coarse and razor-sharp. They will grow to 36". Lemongrass is not difficult to grow in a pot. Water it well during the growing season, but keep on the dry side in winter. It is easier to propagate by division, rather than from seed. If you choose to sow, the temperature for germination should be at least 55 degrees.